William R. Cox (1832-1919), Brig. General, CSA (NC). Participated at Sharpsburg, Fredericksburg, Chancellorsville (WIA), Spotsylvania, 1864 Shenandoah Valley Campaign. WIA 11 times. 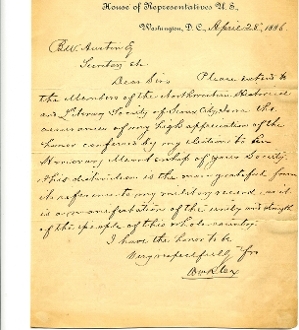 Autograph Letter Signed (ALS), U.S. House of Representatives, Washington D.C. 4/28/86 pertaining to membership in Iowa Historical & Literary Society.